While it is sad to be leaving Bend, it is a welcome idea to be meeting up with friends tomorrow in Hood River. My fellow Beerploma blogger and A One Pint Stand co-host, Eric Wentling recommended stopping in Hood River. I am more than happy to oblige and discover yet another beautiful town with unbeatable beer. It is also nice to step off the gas a bit because the pace of my beercation over the last couple of days has been frenetic. I also realize that this will be one of my last major drives through scenery that looks like it is ripped from a National Geographic Special. This particular leg of the journey has me driving around Mt. Hood. There are other mountains, of course, and the forests continue to wow me. I stop off several times at lookout points to take pictures and marvel at how magnificent the scenery is. The drive is a couple hours and the periodic stopping to take a picture or two only adds to the arrival time. I am fine with this relaxed pace. It is a Sunday and I just watched Colombia trounce Poland in a World Cup game. All is right with the world. My mood is relaxed and the forest vistas are only making the journey better. As I get closer to Mt. Hood, its magnificence astounds me. 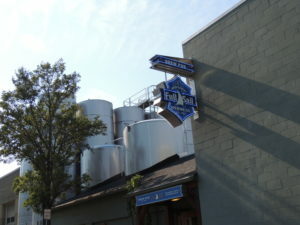 One of a handful of Oregon breweries that distribute in MN is Full Sail Brewing. They are a massive production facility and seemingly take up a whole city block in Hood River. I walk through their gift shop into the brewpub and restaurant area. There is a ton of indoor seating, but I want to sit out on the patio that overlooks the Columbia River Gorge. There aren’t many better views that you can have as you sip and sup than the patio at Full Sail. Lots of good things on the menu, and I am having trouble deciding. I ask the server for her expert advice. What? You think I can beercation without the help of others? She recommends the salmon fish and chips. SALMON fish and chips!?!?!? I have never seen anything like that. I order that along with a taster tray of beers. 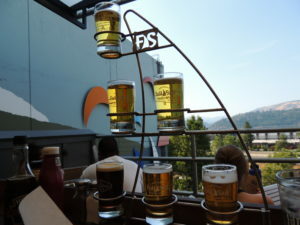 The beers come in a metal holder that is a vertical shape of a sailboat. They have a few geniuses working in the marketing department here. I am all about the lighter lagers because on this patio, there are bright colored sails overhead to keep the sun out of your eyes. There is also a bit of convection heat happening as the air warms and stays in this patio. The beers are all good. I really like the Japanese Lager, Summa Time Lager, and the Session Premium Lager. They are all refreshing and crisp. The other beers I have-IPA, Cascade Pilsner, and Wassail-are good, but didn’t seem to wow me as much as the aforementioned ones. One thing that is insanely mind-blowing is the dish I am feasting on for dinner. The Salmon fish and chips are fantastic. A textural marvel due to the meatiness of the salmon and the thin, almost tempura-like batter on the fish, make it crisp and satisfying. After a great meal and some wonderful and refreshing beers, I realize that there is another brewery just around the corner. I bet you can’t guess what I am going to do next. . . 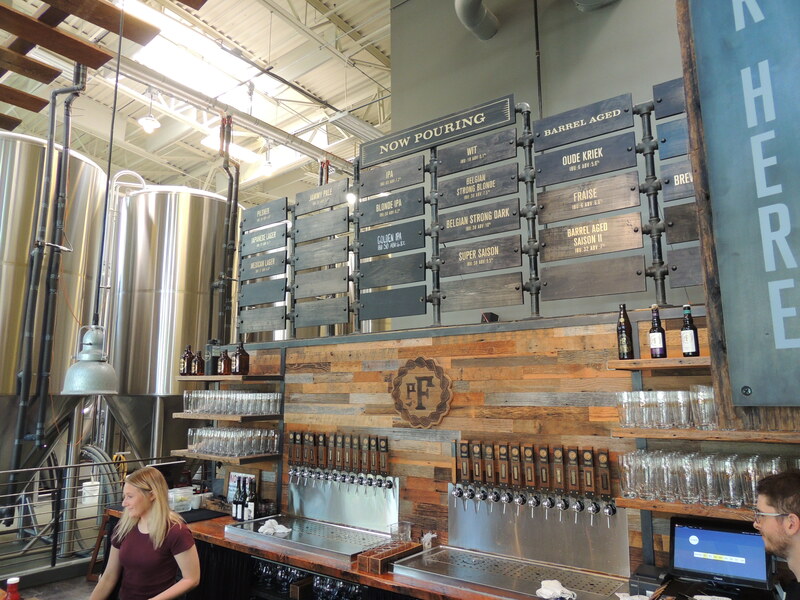 Thank goodness there is no shortage of great food at breweries in Oregon. I can smell the aromas of delicious pizza halfway down the block. The outdoor seating is mobbed and the inside seating is also packed. I grab a spot at the second of two bars in the place. 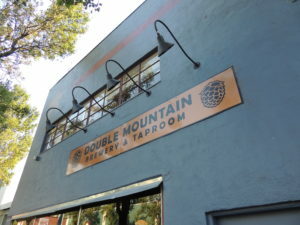 Double Mountain Brewery has a variety of styles on tap, but most of the offerings are hop-forward. The vibe of the brewery is inviting and hip. It says something that on a Sunday night, a brewery is packed at 7:30 in the evening. I go for a mix of the lagers and the hoppy beers. The Kölsch has a cracker and bread character in the malt and has a remarkably clean finish. The hallmark kiss of honey from the malt makes this beer a winner right off the bat. While the Kölsch is my favorite beer and a style I am happy to see enjoying a resurgence, I also need to try their hoppy offerings. Of the hoppy beers, I try many. 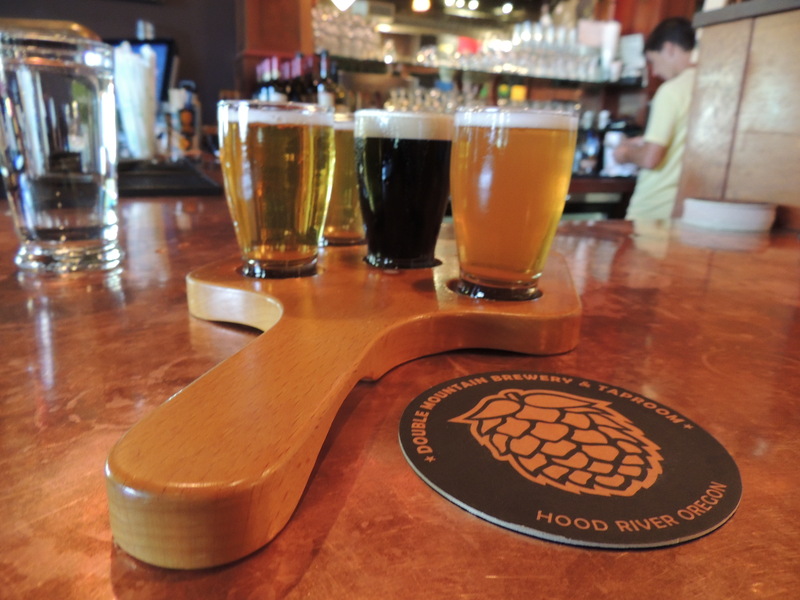 The Hop Lava, the Hop Lion, The Hook pale ale, and the In The Pines all showcase different hop flavors and aromas admirably. The Hop Lion is easily my favorite one due to its balance. The Hop Lion has citrus and tropical fruit flavors with a nice sticky and resiny finish. The Hop Lava is much danker in its hoppiness. Lots of pine and resin in the finish and it is a lot more assertive; the perfect beer for an old-school hophead. Now that my palate is hopped up and satiated, I think it is time to call it a night. I get a bit of a hankering for a something sweet. Surely there has to be something on my way home to appease my sweet tooth. The Google tells me that there is an ice cream place on the way home, so I head there for a sweet treat. The place is called Mike’s Ice Cream. They only take cash, but if you don’t have cash, you can do an I.O.U., something that restores my faith in humanity. I am all in for the pistachio and salted caramel. The double scoop in a made-from-scratch cone is just what I needed to settle the hops on my tongue. The sun is setting and it is time to head back to the Airbnb. As you know by now, I love coffee. It is literally in my genetic code. So, getting up to get a cup of coffee is almost more important than finding my first pint. I am stopping in at 10 Speed Coffee Bar this morning to do a bit of writing. While the previous day’s brewery visits made me really like Hood River, my coffee experience today has made me fall in love with this town. The coffee is great, but the feel of this little neighborhood place is even better. There are locals coming in to jumpstart their days with caffeine. The Barista is incredibly welcoming and friendly. As I type away, more people stop in to chat with friends and someone I believe to be the owner. The sun is shining and the words are flowing this morning. There is only one thing that can usually make me stop a good stretch of writing and that is meeting someone for a beer. 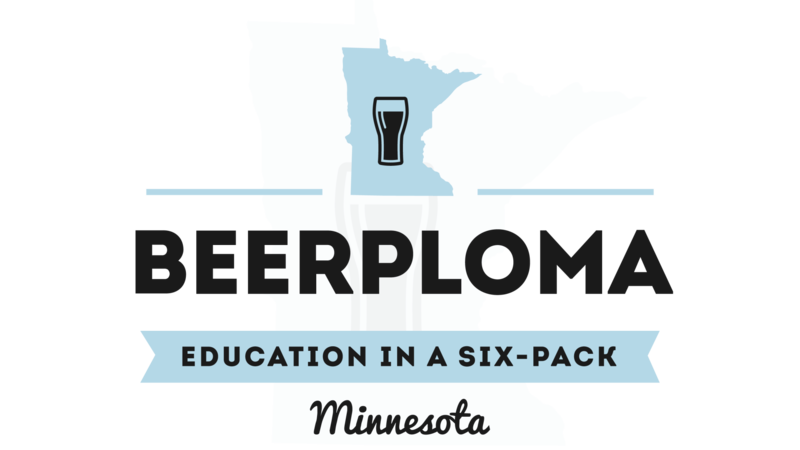 On a beercation, I typically remember with sharp clarity a transcendent beer experience. Typically, these beers are either amazingly-hopped beers or decadent, velvety, and smooth barrel aged stouts. A lager rarely leaves a lasting impression because it is such a simple beer style. However, when a lager gives you pause to marvel at it, it is due to unmistakable genius and artistry in a beer from such simple and humble origins. 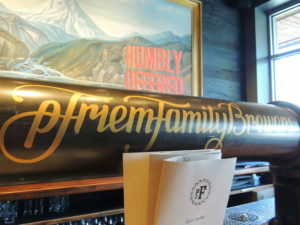 Let me tell you about the pFriem Family Brewers and their pilsner. 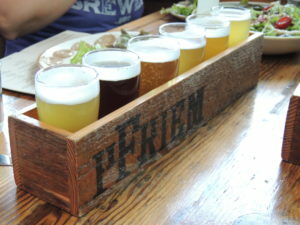 On a day that is sunny, breezy, and perfect, I am meeting up with my beer friends at pFriem Family Brewers. 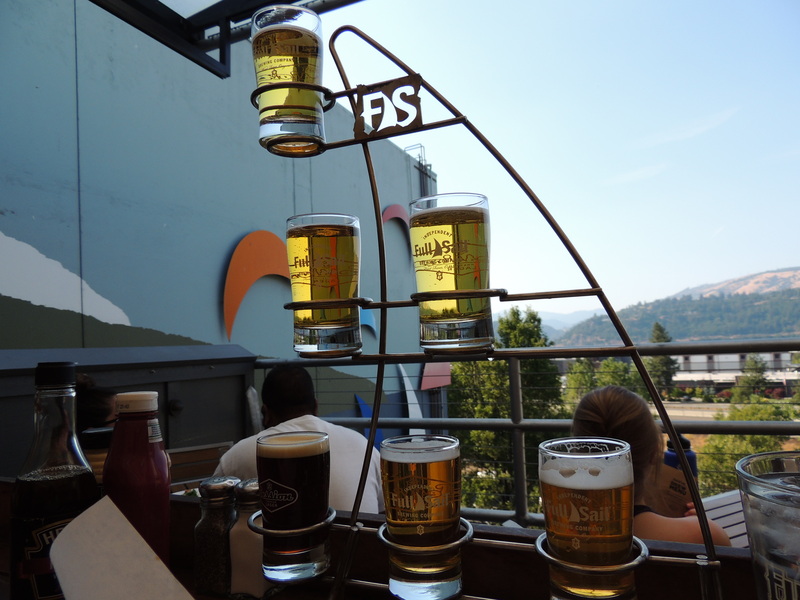 This brewery is across the street from a park that abuts the Columbia River and all its stunning natural marvels. The only thing better than a wonderful beer on the beer trail is meeting up with beer friends. Beer is social and is truly at its best when it is enjoyed amongst friends. Since I know few people that can take weeks off at a time to take a beercation, I am happy to be able to see some familiar faces. Eric, Sarajo, Ron, and Denise are all waiting for me when I walk in. Smiles match the sunshine flooding the taproom today. Ron and Denise are great people who I met last summer at the 2017 Homebrew Con. Of course, Eric and Sarajo are dear friends of mine and our party of five will be taking the 2018 Homebrew Con by storm. 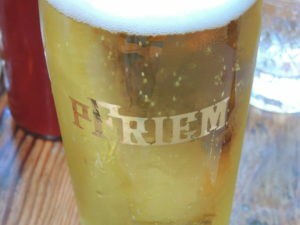 They have ordered tasters of everything that pFriem is pouring today and the menu is making me drool. I order the pimento cheeseburger and start sampling. I start with the pilsner, unaware of how my beer world is about to change and casually take a sip. Before the tasting glass even reaches my lips, the hairs on my neck are standing on end like quills on an aroused porcupine. I take a sip and I lack the words that will do this beer justice. 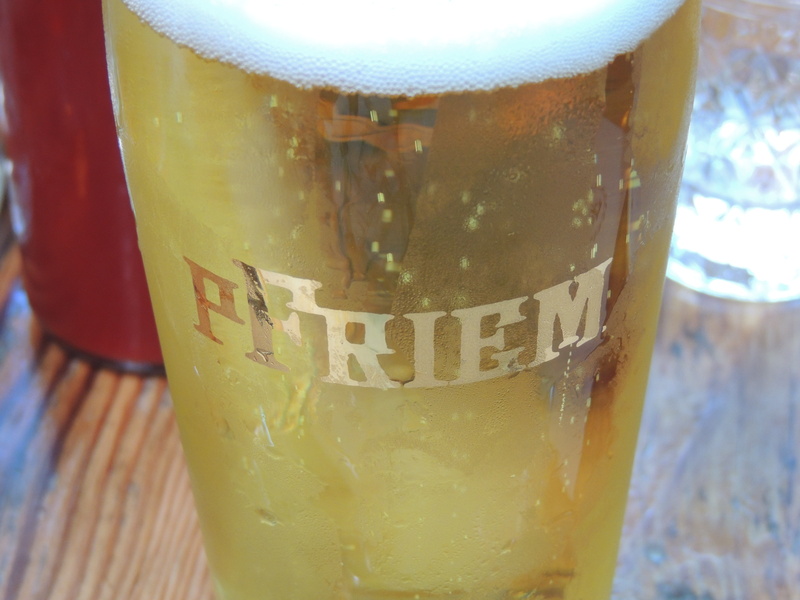 Perfection, heaven, and world-class are all descriptors for the pFriem pilsner. This beer is incredible; it drinks fantastically crisp and clean. The malt is there, but only for balance and a hint of honey and bread. The hops provide a bit of spice and lemon citrus. Maybe I should just stop here and head home. Surely the beer won’t get any better than this on the trip. I haven’t even been to Portland yet!!! Well, the rest of the beers are all great. The IPA is also as close to perfect as an IPA can be. The Belgian Strong Blonde is also damn-near perfect. I am amazed by all the flavors and nuance in the beers here. Just when I think things can’t get any better, my burger arrives. Juicy, cheesy, and tasty, this place has to be a secret leyline to culinary perfection. 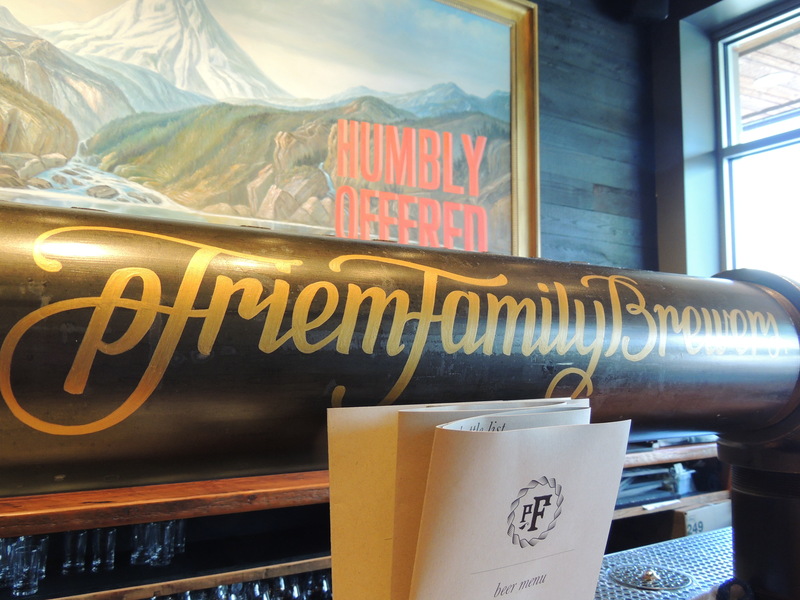 All around the table, there are smiles, audible groans of pleasure, and people trying to come up with words to describe the wonderment that is the pFriem Family Brewers experience. 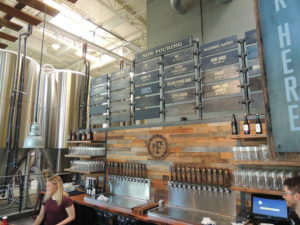 Now that we have a fabulous fivesome, we venture back to Full Sail Brewing and Double Mountain Brewery. After we are done with the tasting and exploring, we set our course for Portland. The epicenter of my beercation is just an hour away. 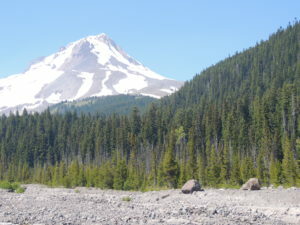 I guess that is really the only thing that can pry me away from Hood River. What a great 2 days of beer tasting, coffee, and food!